I’m curious: how often do you guys make your own yeast breads, buns or rolls? For me, I think it actually used to be something I did more often a year or two before (right when I posted these Buttery Bread Machine Rolls), but lately I haven’t been into it that much. It’s easy to find good quality bread and buns these days (and they’re inexpensive, too! ), so often I give in and just buy it. But I think there’s nothing as therapeutic for me as playing with yeast dough in the kitchen when I’ve got nowhere else to be. It’s such a labor of love, and the results are out of this world (and yes, there are some great store bough or bakery breads but nothing like the bread you make yourself!). It also opens up the world of other yeast breads — cinnamon buns perhaps?? One benefit of making your own bread is you can sample it just minutes after it’s out of the oven (<— amazing). Also, that smell. I am a bit obsessive when it comes to good smelling things. Hand soaps, lotions, shampoos, cleaning products, wax melts. Ooooh, my wax melts. I think I have about 20 different scents in my stash and I am always on the hunt for more. And let me tell you — if they made one that captured, “Fresh Homemade Bread”, I would be all over it. That and banana bread. If someone as equally enthusiastic as I am could dream those up for me, that would be great, thanks. Maybe a new line of products here on The Recipe Rebel? Kitchen inspired wax melt scents? Don’t encourage this madness. Just keep scrolling. 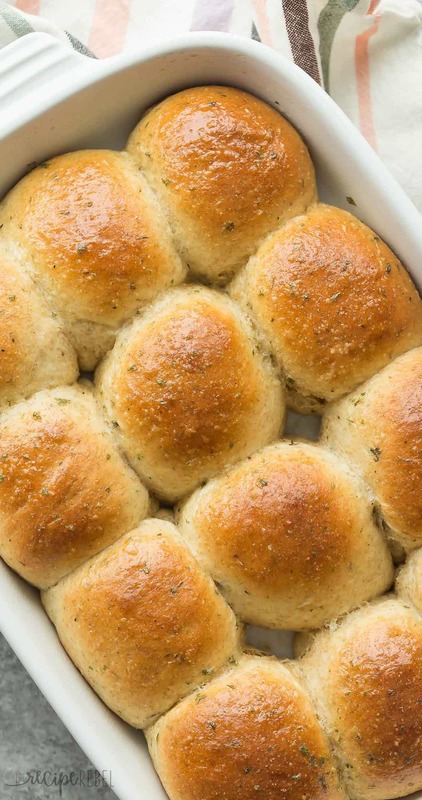 And since it’s not summer yet, I’m still in full-blown soup-with-a-side-of-bread mode, and these Garlic Herb Rolls are perfect for dunking. They are soft, fluffy, and flavorful but not overpowering. No need to be intimidated if this is your first time baking with yeast! You’ve just got to take it slow and not rush the rise — that’s what’s going to get you those fluffy buns. Homemade dinner rolls that are easier than you think, with a step by step recipe video and tons of garlic herb flavor! They're perfectly soft and fluffy. In a large bowl (the bowl of your stand mixer if using), whisk together milk and yeast. Let sit for 5-10 minutes until bubbly -- this is how you know your yeast is working. Add butter, sugar, eggs, salt, garlic powder, parsley, basil and thyme and mix with whisk or stand mixer until eggs are beaten (butter will still be a little chunky, and that's okay). Add the flour and mix with a dough hook (or your hands!) until smooth but slightly sticky. Place in a greased bowl and turn to coat the ball of dough. Cover with plastic wrap or a clean towel and set in a warm place to rise for 60-90 minutes, until doubled. Lightly grease a 9x13" pan and roll dough into 12-14 balls. Place in pan and cover to let rise for about 30 minutes, until doubled again. Meanwhile, heat oven to 350 degrees F.
Bake for 22-25 minutes, until medium golden brown. Garlic butter:Stir together melted butter, garlic powder and parsley and brush over rolls if desired. Serve warm. These freeze perfectly, so make a big batch to keep for later! *Nutrition information is estimated and will depend on types and brands of products used. Calculated without additional garlic butter. 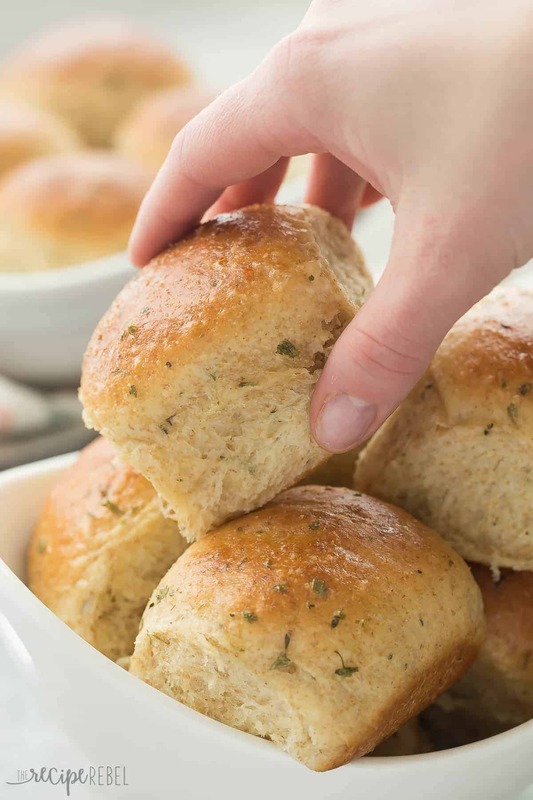 Homemade dinner rolls that are easier than you think, with a step by step recipe video and tons of garlic herb flavor! They’re perfectly soft and fluffy. In a large bowl (the bowl of your stand mixer if using), whisk together milk and yeast. Let sit for 5-10 minutes until bubbly — this is how you know your yeast is working. Add butter, sugar, eggs, salt, garlic powder, parsley, basil and thyme and mix with whisk or stand mixer until eggs are beaten (butter will still be a little chunky, and that’s okay). Lightly grease a 9×13″ pan and roll dough into 12-14 balls. Place in pan and cover to let rise for about 30 minutes, until doubled again. Stir together melted butter, garlic powder and parsley and brush over rolls if desired. Serve warm. Hi Ashley, i made the bread tonight. It was my first time to bake a bread with yeast. The top did not brown and was crusty. Is tthe bread suppose to be with a crusty top?. Im not sure if i over proof it. I notice that it did not grow while baking and it took longer than 25 mins. For the herbs,do you use dried or ground herbs? These are delicious. I veganized the recipe. I used coconut milk from a can because that was all I had, follow your heart vegan butter and egg replacer (red mill brand). I was nervous but the recipe was so easy they worked out very tasty. I also doubled the seasoning because I wanted a stronger flavor. I imagine non veganized these would be amazing but as I made them they are delicious and I’d make them again. I have a stand mixer but was to lazy to use it. Thank you for sharing your swaps! I’m so happy they turned out well for you! I’m hoping to make these for Thanksgiving at my sister’s house, but the oven will be busy with other dishes! If I bake them the day before will they still be good? Any hints? They will definitely be good but if possible I would warm them in the oven on a low temp for just a bit before serving. In a pinch, the microwave will do. Can i use Savory Nutritional naturl yeast flakes instead or instant yeast? I can’t really say as I have never worked with them before. You can certainly add nutritional yeast, but keep in mind that nutritional yeast is dead, so it will not have the same leavening properties as active yeast. If making a batch to freeze, should they be just rolled out and then froze….or should they be rolled out and then let rise before freezing? Hi Sheila! I actually usually bake completely and then freeze. They reheat easily in the microwave on top of a paper towel or on low heat in the oven after thawing! You should be able to roll the buns, then flash freeze (I would thaw and do the second rise just before you bake), and place in a freezer bag. I would flash freeze on a baking sheet just until they’re firm to touch but not leave them too long. I hope that helps! I came across the recipe today and my sister is having Thanksgiving dinner at her house tomorrow, so it’s too late for me to make these for that dinner. I’m planning to make them for Christmas dinner instead. How easy is it to make the dough without a stand mixer? I don’t have one and I’d like to give these a try. My poor parents and sister’s family are guinea pigs for new recipes. I just made them and did it all by hand. I used a hand whisk, and when I added the sugar & butter I switched to a wooden spoon, and continued with the spoon after the flour was added. I had to add just a tad more flour and use my hands before putting into the lightly greased bowl for it to rise the first time. I have arthritis and DDD in my neck and it affects my arms, I did good today. Made them with bread flour versus all purpose and they turned out like biscuits somehow?? Still very tasty! Just not the soft goodness I wanted! Will try again and see if they get better! That is strange! I’ve never tried with bread flour, but I think it should have worked fine? These were so light & fluffy but needed more than called for amount of seasonings! Followed recipe as stated & were delicious; amount of seasonings certainly a matter of personal taste!! 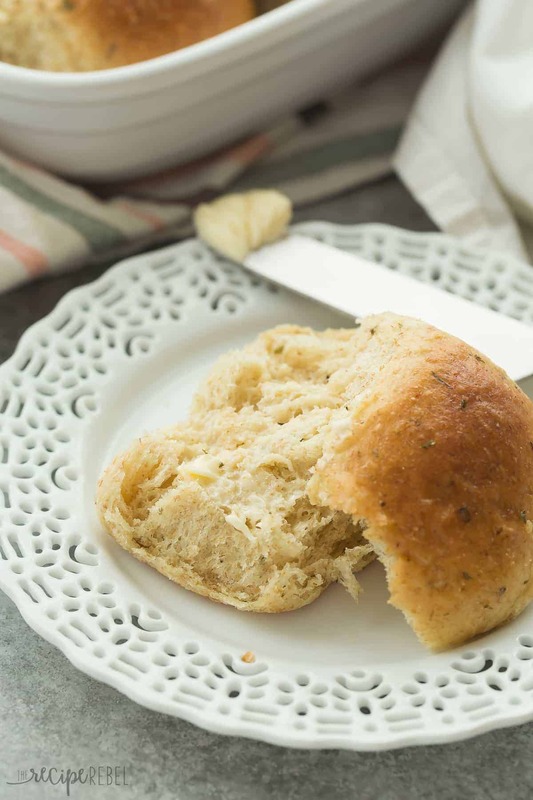 Adding this recipe to my numerous bread/roll collection! ? I made them. My was dense and heavy in texture. I added more seasonings and two tablespoons of honey. How do i get them fluffy? I’m sorry to hear that! They are best fresh out of the oven or warmed, but they shouldn’t be dense and heavy. I would make sure that your yeast is still good and your water isn’t too hot or too cold as that will help make your rolls extra fluffy. Could I use bred or strong flour to make the dough?? I’m sure that will work just fine, though I’ve never tried it myself. I made these tonight and they tasted like they were missing something. Almost tasted blan/ flavorless. Only thing I can think of is not enough salt. Might try making them again because the dough smelt wonderful. I’d like to try this recipe. I am a novice at bread making. Can I use bread flour and all purpose or only one type? I have never tried this recipe using bread flour, so I can’t really say. I try to keep my recipes to regular all purpose or whole wheat flour just for simplicity. I don’t think you need bread flour, but you can definitely try it! I don’t have wheat flour so would I use 4 cups of all purpose flour?? Thank you! Yes that works just fine! Great roll recipe. The recipe makes 12 large rolls. I have made this recipe twice now. I used 1t. salt and doubled the spices the second time and we enjoyed the extra flavor. These rolls are easy to make and freeze well. Thanks for the recipe… will definitely be make again!! Can you use all whole wheat flour instead of the two cups of all purpose flour? Is there any way to skip egg in this recipe else all looks amazingly yummy. Please advice an alternate for eggs. I can’t really advise an alternative to the eggs, but there are lots of dinner rolls recipes made without eggs if you take a look. I hope that helps! You can remplace eggs by using water and chia seeds. I’m not sure about the proportions, you can google it. Great recipe! First time making dinner rolls. I let them raise for an extra hour after I divided the dough, they turned out so light and fluffy. And the flavor with the herbs is a nice touch. Will be making these again! Can I add extra sugar and omitt the herbs to turn it into sweet dinner rolls? Thanks Viv! I have never tried extra sugar, but I’d love to hear how they turn out! 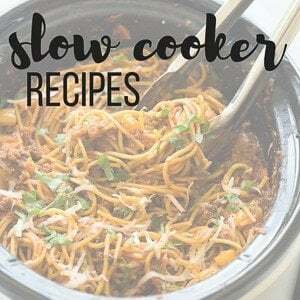 Making this right now and I was super excited to make it because it says total time 55 minutes and then you make it and it says rise for 60-90 min!!! I’m kinda mad about that because now I’m half way through making this and it won’t be ready in time for dinner because the total time is way off please fix!!! The total time accounts for active time only unfortunately, so prep time plus cook time. It does not automatically add in inactive time. So do you use 4 cups of flour or just 2? You will use the amount of flour listed in the recipe. I just purchased a new bread machine and am getting back into baking bread. This recipe looks great and I can almost smell it! Just wondering if you ever use a bread machine for mixing and kneading your dough before baking. I put off buying one for yrs and consequently stopped baking bread since my arthritis is so bad in my hands and wrists. Anyway I am thinking of halfing this recipe and mixing and kneading in my bread machine then baking as normal in the oven. Any ideas or hints for this? Hi Cyndi! I haven’t since my bread machine died a number of years ago, but I used to love prepping the dough in the bread machine! I honestly can’t remember much about it, so I would look into your manual and follow the instructions there, but the recipe itself should work fine. Let me know how it goes! Oh my word — that must smell incredible! I made these buns not too long ago and they were very yummy and fluffy I’ve been asked to make them again for Christmas but the family wants these as well as regular dinner rolls. 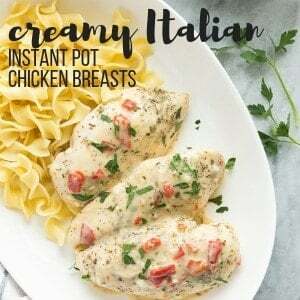 Could i make these without the garlic and herbs and make regular ones? Should I add more flour do you think? Thanks for sharing! I live at high elevation, any changes I should heed? Can wait to smell these bad boys baking! I’m a home-made-bread-scent-fanatic myself! Hi Jessica! Unfortunately I am no expert at baking at high elevations. 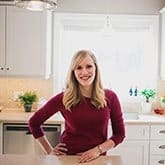 I would check out this resource here: https://www.kingarthurflour.com/learn/high-altitude-baking.html. Let me know how they turn out! You may be able to roll them, cover and refrigerate overnight. I haven’t tried, but I’d love to hear if you do! Hi, can I freeze the dough and bake them the next day? I actually haven’t ever tried that so I’m not totally sure. If you do try it I’d love to hear how they turn out! Please advise whether the basil, parsley and thyme for the dough should be fresh or dried. I cannot wait to try this recipe. Nothing better than warm bread and garlic. I am obsessed with yummy smells too and actually found a banana bread wax melt scent at Wal-Mart. Oh my word, I need to find that! It sounds amazing! These look so good. I want to make them tomorow but just want to clarify the yeast. I googled active dry yeast vs instant and it said for instant that it should be combined with other dry ingredients then warm liquid added and active dry yeast is added directly to warm liquid. It also said instant only takes about 10 minutes to double vs 2 hours for active. So I am assuming you are using active dry yeast not instant but want to make sure as I am new to bread making. What I have is Fleischmann’s active dry yeast. Will that work? Hi Teressa! That’s a good question! And no, I am using instant yeast and I use it just like I said. Active dry yeast should work just as well, but I prefer to use instant yeast for everything because I just find it rises better and more easily, I still let it bloom and rise just like active dry yeast. You should be able to use active dry the same way. Hi There! How do you freeze these? 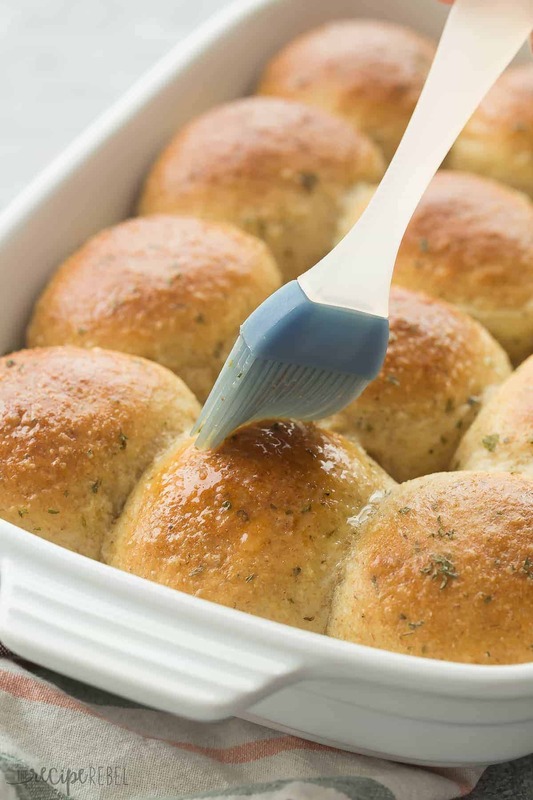 Do you freeze the dough balls or once you’ve baked them? Thanks! I freeze them baked and then cover and reheat at a low oven temperature, like 250, just until warm. Can you tell me if it matters whether I use whole milk or fat free milk for bread recipes? What is your experience with this? Thanks again, so glad I found your blog! Yes, sugar can definitely help the process! Hi Lynne! They are still soft but it’s not quite the same as fresh. 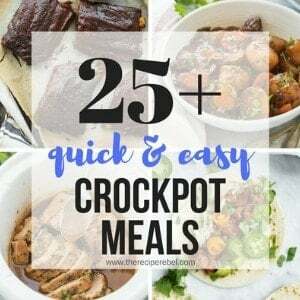 If you make them ahead, I would just put them in the pan in the oven on a low heat (maybe 250 degrees F) for 5-10 minutes until they are warm again. They should be just as good as fresh then! Yes, just what it says in the recipe. You can use all all-purpose if you prefer though. So I could use bred flour too. Oh my gosh I am the HUGEST sucker for homemade dinner rolls. They get me every time and I practically ignore every other part of the meal! LOL. Looooooove all the garlic and herbs on these little babies! I made these as buns and were amazing! Would the recipe work as loaves? I hardly ever make my own bread or rolls from scratch, mainly because I’m too lazy! But when I do, it’s totally worth the effort. And seeing these makes me want to do it all the time. Love the garlic herb flavors, Ashley! Definitely my version of a perfect dinner roll! Hi. Can u pls advise if that was a total of 2 or 4 cups flour? It is exactly what’s listed. 2 cups of whole wheat, 2 cups of all purpose. If you don’t like the taste or texture of whole wheat buns, you can use all all purpose.